Blackberry is back and this time with its newest device called the Blackberry's Passport which is latest offering from Blackberry targeted towards productivity-driven business professionals which is in line with its traditions. Name "Passport" is derived from the fact that the phone bears the same dimensions as an American passport: 128 x 90.3 x 9.3mm. Now that is Smartness by a Smart Phone. Due to its unusual square display and with a three-row physical keyboard, the phone instantly catches attention. 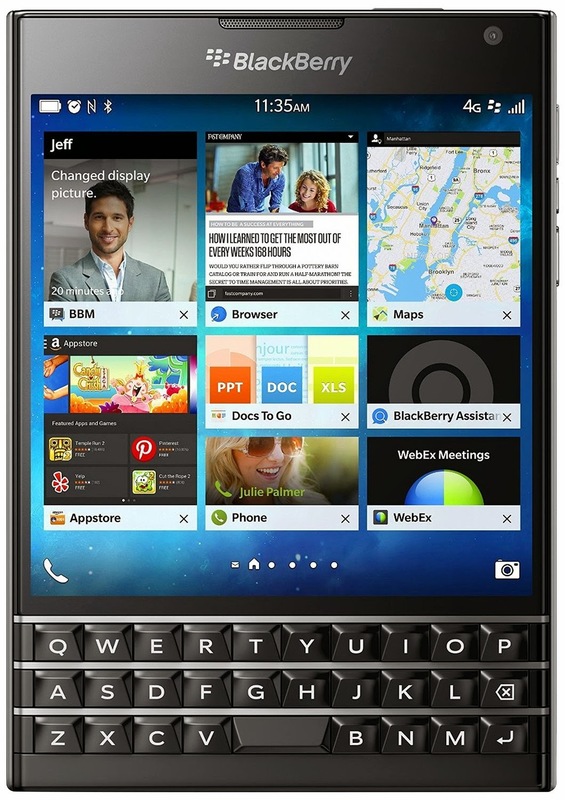 The phone is full of features and is being looked at a game changer for Blackberry. From first side, if not the the game changer, there are definitely things you would not want to ignore.There is some good news for early birds, Rs 5000 worth of gift vouchers ( which are redeemable at Amazon.in) and Rs 5000 worth of frequent flyer miles with Jet Airways are being given away as well. Now that looks like a deal and for all that you need to book this phone before October 10. 'Passport' is blessed with a large square shaped 4.5-inch worth of IPS display. At 1440 x 1440 resolution with the pixel density hits the 453 ppi mark, which is pretty neat and impressive. The company is promising that the screen is going to be a major advantage for professionals who have to access visual data for quick analysis and other critical business applications like spreadsheet view, faster apps etc. Performance of the phone was extremely smooth with smart web browsing experience, and quick apps. The Passport is blessed with Blackberry OS 10.3 as well and the new operating system has been revamped visually for example the Bloomberg Professional app for professionals working in the finance sector is something we did not see in any of the existing smart phone. Another impressive feature is Blackberry Assistant which is Blackberry's first digital assistant, which can be used with voice or text commands, and Blackberry claims that it can do more activities than Google Now, or Apple's Siri. An interesting feature indeed. The Assistant observes how the user is interacting with it and accordingly very intelligently decides the response. When the user speaks to it, the assistant replies back, and if interacting via Bluetooth and it also helps out the user with emails, contacts, calendar and other Blackberry 10 Applications. The Blackberry Blend feature is one of the key USP of this phone. Blend is kind of a dashboard, and its main function is to display the work related as well as the personal e mails, text and BBM messages and calendars and these can be displayed on PC, Macs, an iPad and Android tablets as well. In order to use this feature, Passport needs to be connected via Wi-Fi or cellular network, or a cable with the desired device. This it provides a seamless experience for the business users. Operations such as accessing all the relevant messages, text or mail based, along with the ability to merge the calendar entries in an effortless manner on a large, secondary display really has boosted the OS and the Passport's prospects in a great way. The blackberry phones are bullish on their keyboards, and Passport come with a 3 row capacitive touch keyboard, contextual auto correction, and next word prediction. The inbuilt software that power the keyboard has a learning engine which gets to understand the user's typing style with time. The keyboard can be used as a trackpad to scroll across the screen, without any need of tapping on the screen anywhere and you can even track the cursor while entering text or number. The BB Passoport come with a 13 MP camera on the rear,and a LED flash for assisting during low light conditions.The Optical Image Stabilisation onboard helps the camera to captures 1080p HD videos at 60 fps of frame rate. The rear camera is a 2 MP and can shoot 720p videos with ease. Amazon app store right out of the box is something you will find in this new phone from Blackberry. Now this is really candid , the new BB Operating system allows support for Android apps as well, and with a caveat that there might be a few hiccups here and there with Android apps as they might not be fully optimised yet to run on the Blackberry OS but its worth the try as Blackberry store is pretty outdated now and while Android has largest pool of apps. Blackberry Passport comes with a non-removable 3450 mAh battery that give as decent 30 hours with moderate usage. The phone comes with 32GB of internal storage. The phone thankfully comes with support for external memory card as well. Users can increase the memory upto 128 GB. Now thats a lot of space. Blackberry come for a price of Rs 49,990 in Inida and is available for a pre-order exclusively on Amazon.in. This phone from the Blackberry looks rock solid. But in recent year, the falling popularity and smartphones falling in range of 15K to 30K (INR), we believe its an expensive phone. Ideally if this phone was priced at INR 35,000 it would have been amazing. However will Blackberry, they will sure ensure in few months time the price of this phone is bound to fall in the price range we just mentioned. In case you can wait, place your order today on Amazon. Demonstrates that a copy of an original document is a true copy , in case wherein an individual is planning to go abroad, the individual's original documents need to be attested and to attest the same, the Ministry of External Affairs Government of India (GOI), has given the power to various General Administrative Departments, State Home Departments, Higher Education Department or Sub-Divisional Magistrate, New Delhi, etc. Antique clocks are an exquisite way to add slightly of sophistication, luxury, and class to your home. Visit to browse our obtainable clocks and select the simplest one you would like because of the accent piece of your home. We also customize the Antique Clock, Wooden Clocks, Handcrafted Clocks, Metal Clocks, Mosaique Clocks, V-Series Clocks according to your choice.